Unlike your conventional telephone service which only allow you to make calls, VoIP Fonality allows you to do more. Apart from making calls to anywhere around the world, you also get to send messages and even files through the internet. In a nutshell, VoIP combines your conventional telephone structures with the efficient communication technologies offered by your high-speed internet. The bottomline: VoIP Fonality should simplify your life while allowing you to do more, nevertheless. One of the best features of VoIP Fonality is that it allows you to communicate anywhere and anytime you please– this is one thing that makes it notches above your line-restricted conventional phone or in-office communication lines. VoIP is online as long as your device is online: in which case, ALWAYS. Now, if you’re worried that this big step to improving your company communication lines may be as tasking for you and your folk; you are mistaken big time! The ease of use that comes along with VoIP will make you feel like you’ve missed a lot the whole time you bore yourself with your local telephone lines– and it’s about time to keep up! 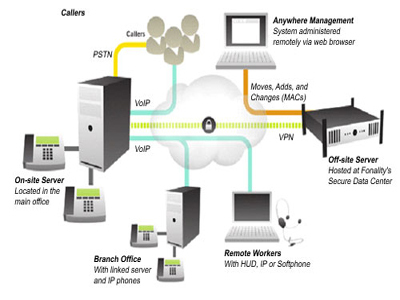 Digital Eye Technologies offer VoIP Fonality solutions for every organization, big or small. Talk to us today to know more about our VoIP Fonality service.